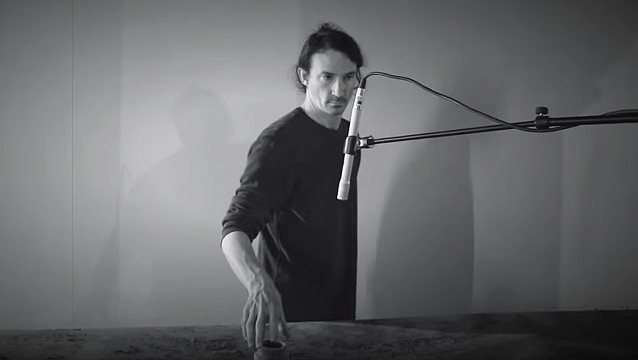 French progressive metallers GOJIRA have uploaded new video footage from the recording sessions for their forthcoming follow-up to 2012's "L'Enfant Sauvage" album. Check out the clip below. In a 2015 interview with Rocksverige.se, GOJIRA frontman Joseph Duplantier stated about the progress of the songwriting sessions for the band's next CD: "We record demos, we jam, we work really hard… super hard on the songs. We wanna put out our greatest album. We do things a little differently. We dump songs, we dump riffs, which we never did before. [In the past] we would prepare 12 songs, get in the studio and record them just exactly as they are on the demos. We decided to do it differently this time. So [on previous albums] we would push each song to its maximum until it becomes really good. But this time we wanna select them right away. [If we come up a riff that sounds slightly] boring [from the start], we [get rid of it] instead of [spending time] trying to make it more interesting. So we have at least 20 songs — like, the main ideas, the core of each one. But we still need, now, to work on putting all the stuff together, but we have a lot of material that we really love this time. It's kind of challenging for us, also, 'cause the style is changing a little bit. We have some PANTERA-ish kind of riffs, which is kind of new for us. But we wanna… Because we want to… We want [the riffs] to be a little punchier sometimes." Asked if GOJIRA will cut down those 20 song ideas to 12 or 13 complete tracks before recording the next album, Duplantier said: "Even to less than that. I want a short, very dynamic kind of album. But we have so much material; we could release three records or something. We believe in simplicity. When we release a record, we do it the old-school way. We could release a song once in a while and that's it. It would be better for these days to do it this way. I think that's what bands will do in the future. I think albums are dying. I think bands are going to work for a week at the end of a tour, release a song and go back on tour. And here you go — the fans are excited… But we're so old school. We still wanna have that big chapter in our career that we call albums that are so important. It's like a personal Bible that we're writing; it's very intense." Duplantier also revealed that he produced the next GOJIRA album himself. "I have to do it myself somehow," he said. "It makes me feel great. I love it. That's what I do. It's what I like. I wanna do it. So everybody's, like, 'Oh, you should work with a big producer.' I don't think so. It could be a very personal sound, it could be a very direct dialog with the fans, without the interaction of anyone. Even if it's a great person, this person is still between us and the fans."